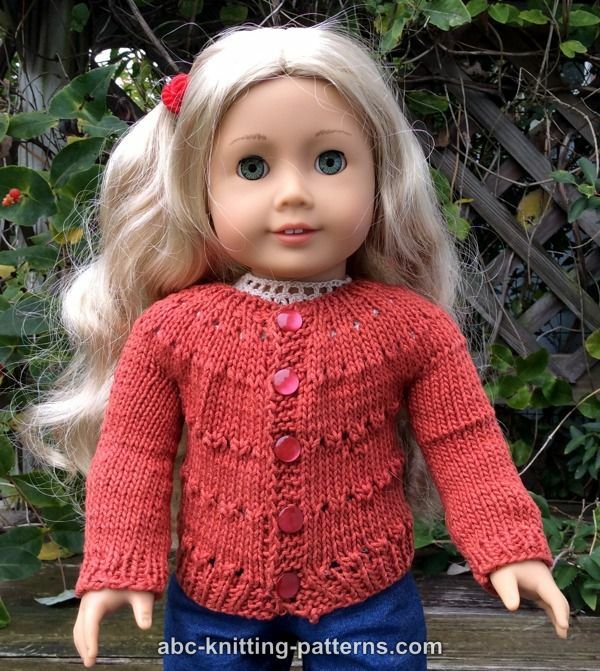 My doll needed something warm to wear with her blue jeans this fall, so I knitted this country-style cardigan. The cardigan is knitted seamless from the top down, back and forth. I often like to do the button band and edging separately after the garment is done, but in this case, the whole thing is knitted as one piece, making the project very streamlined. To add spice, I worked a motif of eyelets every 10th row. It gives the cardigan an interesting texture. The buttonholes in the button band line with the eyelets for an added bit of symmetry. 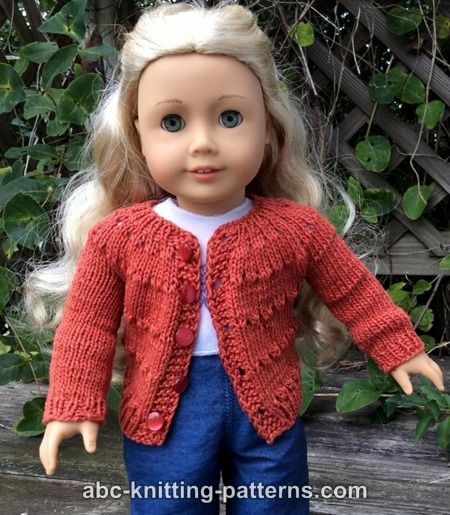 I think your doll will love sporting this casual cardi around town. Notions: yarn needle, 5 small buttons, 2 stitch holders or 2 pieces 10” long of contrasting color waste yarn to hold stitches. as est. 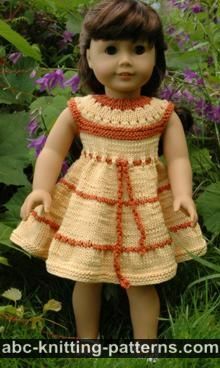 - as established, work as the pattern demands, here knit the RS rows and purl the WS rows. Selvedge/Edge Stitches: The 1st and last stitches of the pattern are selvedge stitches. 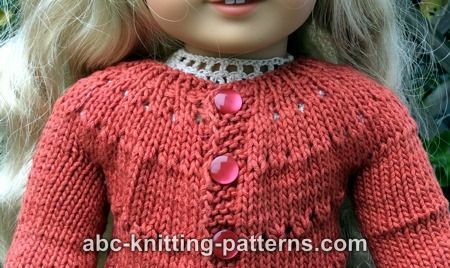 In this pattern I knit the first stitch and purl the last stitch. Button holes are worked on the right button band in the following way: k1, yo, knit 2 together, p1 (selvege st). Work button holes in the end of rows 3, 13, 23, 33, 43. The cardigan is worked top-down, seamlessly, back and forth on circular needles from the mid-front. The sleeves are worked in-the-round on double pointed needles (dpn). Don’t forget to make button holes as described above. Row 5 (RS): K53, p1. Row 6 (WS): K4, p46, k3, p1. Row 8 (WS): K4, p70, k3, p1. Row 9 (RS): K77, p1. Repeat rows 8-9 one more time. Row 12 (WS): repeat row 8. Row 14 (WS): K4, p106, k3, p1. Row 15 (RS): K113, p1. Rows 16 - 17: Repeat rows 14 - 15. Row 19 (RS): k20, transfer the next 22 sts on a stitch holder or to a piece of waste yarn, co 4, k 30, transfer the next 22 sts to another stitch holder or piece of waste yarn, co 4 , k 19, p 1. Row 20 (WS): K4, p70, k3, p1. Row 21 (RS): k77, p 1. Row 22 (WS): repeat row 20. Row 23 (RS, eyelet row): K4, *k2tog, yo, k1 repeat from * 22 times, k2tog, yo, k3, yo, k2tog, p1. Rows 24 -31: repeat rows 20-21 four times more. Row 32 (WS): repeat row 20. Row 33 (RS, eyelet row): repeat row 23. Rows 34-42: repeat rows 20-21 four times more. Row 43 (RS, eyelet row): repeat row 23. Rows 44-45: repeat rows 20-21. Rows 46 – 49: K5, *p1, k1 repeat from * 34, p1, k3, p1. Work 35 rounds in stockinette (all rounds knit), work 4 more rounds in 1x1 rib. Bind off. Cut yarn. 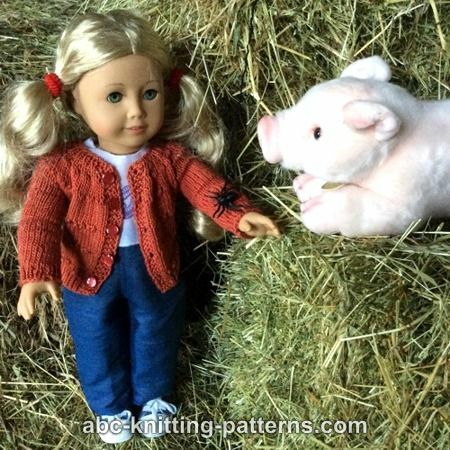 Pattern was updated on August 14, 2018. 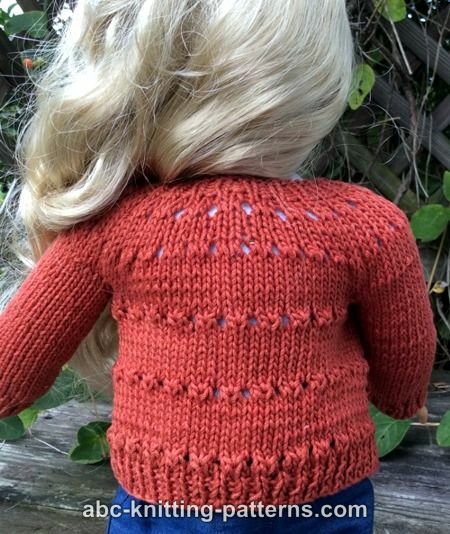 Very sweet little sweater pattern. 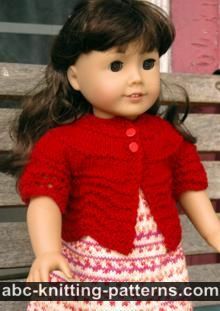 I have made several & everyone likes how the little cardi works with other outfits. Thank you. I am confused with the pattern for autumn cardigan sweater. I start with 54 sts but when I get to row 19 it sais k1 than k19 stransfer 22 co 3 k30 transfer 22 co3. k19, p1. That makes 113 stiches. I cast on only54 stishes. This sweater is as beautiful as any I've ever seen worn--be that by human, doll, or dachshund at PetSmart.